Dogwood trees offer four full seasons of beauty in a garden. You'll get the showy froth of spring blossoms, attractive foliage in summer, bright scarlet fruits in autumn and gorgeous bark in winter. It's no wonder that the dogwood is one of America's most popular trees, especially considering how easy the trees are to plant and maintain in a backyard. If you've inherited a tree that you think might be a dogwood, you can easily identify it by its unique leaves, blossoms, berries and bark. There are many types of dogwood trees. 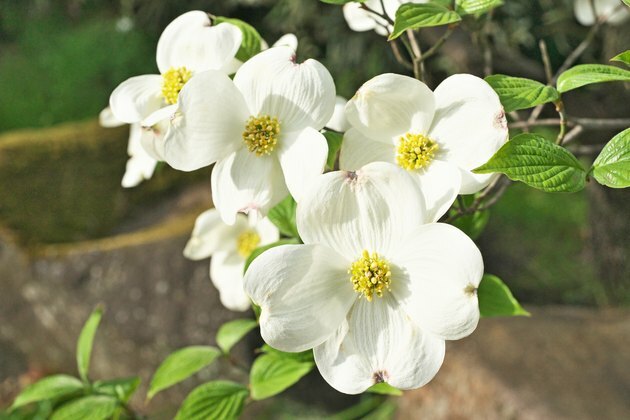 Dogwoods are trees and shrubs in the genus Cornus, and there are so many that they've been divided into four subgenera: Benthamidia, Chamaepericlymenum, Cornus and Swidaare. Still, there are some elements of their leaves that can be used to identify them as dogwoods. Dogwoods are deciduous. That means that the leaves appear in spring, do their photosynthesis magic in summer and then fall in winter. If a tree has leaves in winter, it is definitely not a dogwood. Look for no leaves in winter, green leaves in summer and deep purple shades in autumn. Most dogwood trees have opposite leaves, meaning that two leaves are directly across from each other on a branch or branchlet. A typical dogwood leaf is oval and measures between 3 and 6 inches long. They have visible veins that curve parallel to the margins. Some have dramatic white or yellow variegation. Dogwood trees in spring are more easily identified by their fragrant flowers. They usually bloom in March and April, and each flower has four large bracts that can be white or pink. On the inside of the bracts is a cluster of tiny yellow flowers. They smell wonderful and can stay on the tree for up to four weeks. Not all dogwood species produce fruit, but some do. They look like grapes except that they are brilliant red, growing in clusters near the leaves. Don't eat them. Though some dogwood fruit is edible, some species produce toxic fruit. In winter, dogwoods drop their leaves, exposing the structure of the tree. The branches tend to be horizontal, while the bark has a unique texture. It looks scaly and flakes off easily. The trunks grow from 15 to 30 feet high, while the branches extend some 20 feet when the trees are mature. One of the wonderful things about dogwoods is how easy they are to grow if you follow a few simple rules. 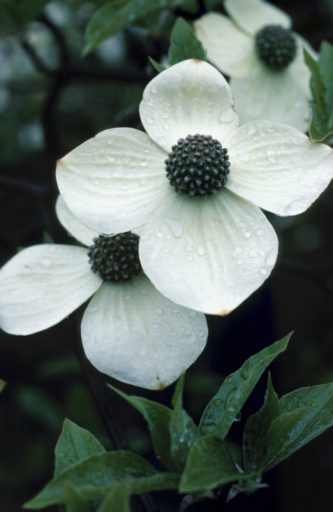 When you are planting a dogwood, pick a site with moist, well-drained soil that is high in organic content. Ideally, opt for a site in partial shade, since dogwoods are under-story trees when they grow in nature. Dogwoods are easy-care trees that do not need special care. A newly transplanted dogwood will adapt quickly. It may bloom the first year and is certain to bloom the second year.